The only in-line editor designed for long-form business writing. Download Your Free 7-Day Trial! WordRake goes beyond grammar and spelling, to the heart of good writing: clear, effective communication. As fast and easy as spell-check, WordRake ripples through your document, making corrections just like a live editor would. Tightening up sloppy phrases. Eliminating clutter. Giving your first draft the polish of a third or fourth draft. Most professional writing is collaborative. Get to the point the first time, and you save yourself – and your colleagues – hours of back-and-forth revisions. Jump-start the editing process with WordRake for Word. 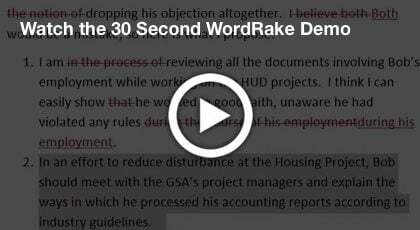 Speed: WordRake can edit 25 pages and suggest 250+ improvements in under a minute. Impact: WordRake users typically accept 7-12 edits per page. Convenience: No need to learn new software; no copy+pasting. WordRake operates within Word, right from the menu bar. Accept the changes you like, reject the ones you don’t. Streamlines sentences to clarify meaning. As quick and as easy as a spell checker. Edits instantly right within Word. Cuts editing time and improves outcomes.